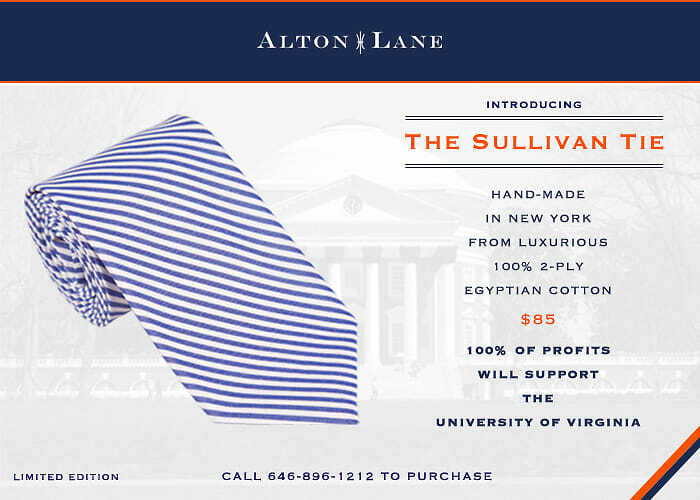 Alton Lane, the upscale custom clothier founded by UVA alumni Colin Hunter and Peyton Jenkins, announced today a special tie in support of UVA’s recently reinstated President Teresa Sullivan. Through this weekend, 100% of the profits from the tie, which is made from 2-ply Egyptian cotton and retails for $85, will be donated to The University of Virginia President's Fund For Excellence. When GofG asked why the tie wasn’t in UVA’s traditional orange and navy, Colin replied, "We wanted a tie that was a bit different than every UVA tie out there. We think this one is special, distinguished and elegant, which we found fitting" of President Sullivan. The UVA drama over Sullivan’s ouster was a PR disaster for the University’s Board of Visitors, and opposition to the initial decision to remove President Sullivan rallied the University’s students, alumni, and professors to urge the Board’s reconsideration. The incident even prompted Bob McDonnnell, Governor of Virginia [and father of twin sons who are athletes at UVA and brothers at the St. Elmo Hall fraternity], to threaten to replace the entire board if the situation was not resolved this week. The Board unanimously voted to reinstate Sullivan. Look for a few of these smart new ties from Alton Lane around grounds soon.